My story begins with my parents, both from different parts of the World. My Mother’s side of the family consists of mostly Hindus or Radhaa Swamis, who all have a lot of respect for Sikhi. My Grandmother gave birth to seven daughters, of which the first five were married in India. The remaining two, the youngest being my mother, were married abroad to English born husbands. My Father’s side of the family were Sikh. His parents were Amritdhari (baptised) and I’ve been told that my Grandmother was an incredible woman who inspired many around her, but I never got to meet her as she passed away before I was born. My Grandfather then remarried and from two wives he had six sons and three daughters, none of whom are religious now. It wouldn’t be an understatement to say my Father is a terrible human being. He was very aggressive and short tempered, and would pursue women of the night (even after marriage). If he wasn’t drunk on the streets, he was sober in jail. He would beat my Mother on many occasions and in those days domestic violence was always kept secret. My Mother was forced to endure this, she was virtually alone with nowhere to run. She tells me today that her Faith in God was what kept her going, and by reading Gurbani or doing seva at the Gurdwara she kept her spirits high. She had the opportunity to take Amrit when she came to England, but the issue with my Father prevented her from doing so. His constant affairs forced us to move town, from Derby to Wolverhampton, but he still didn’t stop. It was only when my Mother found out he got another woman pregnant, that she decided to divorce him. By this time she had given birth to four children, three girls and a boy… Me! My Mother worked hard to raise four children and keep the home, often working 15hours a day. Poverty, as you can imagine, was very much in our lives at the time. During the hardest times of the divorce my sisters decided to rebel. The oldest two left the house to live with my Father, thinking it would give them more freedom. They were incredibly naive to think a man like that could take care of them, and Mother never let them back in the house as her heart was broken. I never saw them again until my eldest sister got Cancer; her funeral, 1st November 1998, brought the family together for at least one day. Even after this, my mother kept the Faith. Later my mother remarried a guy from India, as she was harassed by many for being a single Asian mother. He wears a turban but isn’t a baptised Sikh, and struggled to play the “father role” if I’m honest. It was just me and my sister left in the house, and instead of understanding my Mother’s struggles she did exactly the same as my older two sisters and left the house in 2008. It was just me, my Mother and my Stepdad left. I felt the need to mention all this, because it’s becoming increasingly common story for many children of my generation. My story really begins when I became a teenager. Many would say I was a rather weird child, who loved to laugh and joke a lot, never taking anything too serious. All my cousins kept their hair as kids, but cut it when they were older. As a result, my hair was cut from birth. I was a bright kid who spoke a lot in class, never violent but always disruptive. Mother forced me to go to Punjabi school as a child but I never really felt anything when I went to the Gurdwara. Looking back at it you could say that I lost faith at a young age, and at my school hardly anyone was Religious. I was carefree and there wasn’t really any depth to my personality. Sometimes my comments would be offensive, but if they made me laugh I would keep on saying them. When I turned sixteen years old I was about six feet tall, which in my family meant I was the age to start drinking. I never smoked, but the moment I had my first taste of alcohol I knew this was a feeling I’d like to experience again. It was at my Nephew’s first birthday party where my Mother found out I was drinking, where I simply drank until I lost consciousness (lousy open bar). Even now my cousins make fun of me, but at that moment in time I was “enjoying life” even with vomit all over me. Mother was disappointed and told me I should stop now, but what sixteen year old listens to their Mother? I would continue to drink at family functions and when I became of the legal age, I would drink with my friends at the local park. I would drink a lot of Whiskey, not because of the taste, only because my body could take a lot of it – and apparently the more you drank the more of a “man” you were. I would also drink a lot of Strongbow Super because it got me drunk faster. When I got a part-time job catering at Asian weddings, free alcohol became incredibly easy to get. The more I drank, the more I just wanted to get drunk and forget the World. As time went on I found myself falling into a deep hole and kept on using alcohol to escape, sometimes even drinking alone, but as you can imagine this only made things worse. I would put on a face at school but my relations with people weren’t always the best. At home, I would argue with my Mother a lot and at one point I felt so low that I reached for some pills and just decided to call it quits. I’m still here, so it was a failed attempt, but I was still slipping. I had a girlfriend at the time who I forced to suffer with me, I was pretty hard to tolerate and our rocky relationship made me want to drink more. My sister who hadn’t moved out yet was a nightmare to live with and was confrontational almost every day, which made me bottle up a lot of my emotion. At school my grades would suffer because I just lacked the will to go on, life at this point seemed rather pointless. But then, as if out of nowhere, I bumped into some Sikhs! My neighbour and his family were practising Sikhs and had good relations with my Mother. I started to play football with one of their sons who treated me like a little brother. Due to my social habits I wasn’t very good (mostly fitness reasons) but I got introduced to a lot of other Sikhs in the community as well. I became good friends with a few who, through general conversation, got me to go to the Gurdwara again. I noticed something in their lives that I didn’t have, and felt the need to explore. When I turned nineteen in 2007 I finished Highschool and got into University of Wolverhampton to study Mathematics. Staying in my hometown meant I didn’t go clubbing because my Mother hated me staying out late at night, so instead I would attend local Sikh events such as “Saint Souldier Youth Forums”, which in hindsight came at the perfect time. At University my mentality changed and I started to use my brain a lot more, viewing life and my actions in a more logical manner. At the Forums I met many inspirational people who asked questions that I had no response to. For example; “What is your life purpose?”. The more I explored, the happier I felt, and as time went on I started questioning my own actions such as drinking alcohol, eating meat, and the lack of respect I had for my own Mother. It was like I woke up from a bad dream and felt like a brand new person. With God’s grace I left my catering job and gave up alcohol for good. My friends were surprised and kept asking whether I was tempted to drink again, I could honestly say I had no more desire to get drunk! I wanted to keep my hair, but that took more time due to vanity issues (my beard only grew on one side of my face). As time went on I felt guilty and upset when I shaved, so around April 2008 I stopped cutting my hair. I’m one of those people that find it difficult to do things I know I shouldn’t be doing, which helped in this transition. Sometimes the mind can be our greatest enemy. I use to have terrible nightmares that I shaved my beard off, but then when I woke up I would grab it and thank God for such a beautiful blessing. Finally, on 16th November 2008 (which was Guru Nanak’s Gurpurab) I decided to give my head to my Guru and take Amrit. It’s important to understand that this is the first real step a Sikh can take in their Spiritual journey, and for me the timing couldn’t be more perfect. Just before I took Amrit I faced a huge test in my life where my lung collapsed. 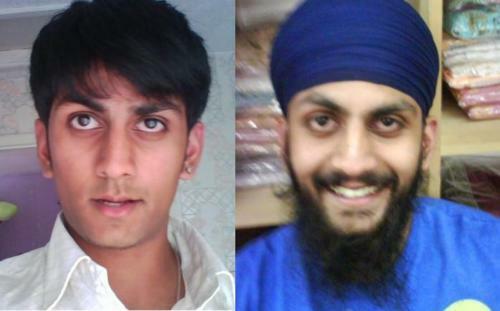 I had just started growing my hair (but hadn’t taken Amrit) and was hospitalised for about a month. The pain I went through was unreal but, it was Gurbani that kept me going. My neighbours came to visit me and one of the conversations we had were about suffering. I was curious to know, why now? Why, when I’ve decided to walk a more righteous path must I suffer? To which the response I got was; “Just think of what you could be going through had you not changed paths.” And so be it, the glass in my life became half full and has been ever since. As my journey continued I got the opportunity to help run the Forums that inspired me for a short while, and then the Sikh Society at my old University. I also made a very good Christian friend who would take me to his Church where I made some very blessed Christians friends that showed me God’s grace has no limitations. I enjoy Religion a lot more and explore other faiths, just to see life through the eyes of other people is what interests most. Sikhi really is the embodiment of Inter-Faith and its foundations allow for tolerance and peace towards others. It has now been seven years since I took Amrit and I’ve learnt a lot on this journey. If I could share anything it would be to respect your parents and understand the sacrifices they have made to bring you into this World. For me, it took nearly twenty years to finally treat my Mother with a bit of respect but now she can honestly say she is proud of me (her words, not mine). I am a tribute to my Mother’s love for me, and we are both a tribute to Guru Nanak’s love for his Sikhs. I do regret my actions like most people would, but I understand they hold their own purpose and that part of my life was a learning curve that has given me strong foundations for the rest of my life. Sometimes we all feel low, but it’s important not to cover up the issue like I did, and truly understand your own worth. I’m happy now, and have been for many years. Having good people around you is important, having faith in yourself is essential. We are blessed beyond measure. The Word of the Guru’s Shabad is my Saving Grace.